Racist abortion advocate Margaret Sanger, founder of Planned Parenthood, and a personal heroine of Hillary Clinton’s, could not have asked for a better outcome for her despicable creation – in New York more African – American babies are now being aborted than are being born. According to LifeSiteNews, New York City’s Department of Health reported that in 2012, more black babies were aborted (31,328) than born (24,758). That’s 55.9 percent of black babies killed before birth. 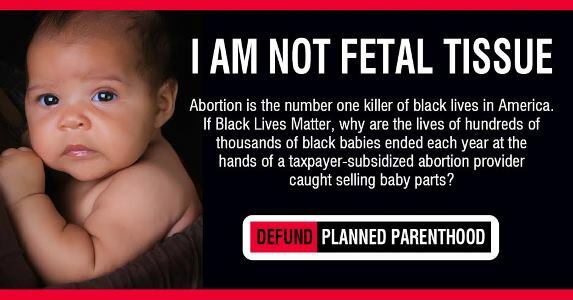 Blacks represented 42.4 percent of all abortions. Sanger, the founder of Planned Parenthood (the nation’s largest abortion provider) was part of the eugenics movement back in the 1930s. Her goal was to use abortion to cull what she considered inferior races from the human gene pool. And, said Ken Blackwell, some black leaders are still acting as Judas goats today. Rev. Dr. Childress says on average, 1,876 black babies are aborted every day in the United States. This incidence of abortion has resulted in a tremendous loss of life. It has been estimated that since 1973 Black women have had about 16 million abortions. Michael Novak, notes Rev. Dr. Childress, has calculated "Since the number of current living Blacks (in the U.S.) is 36 million, the missing 16 million represents an enormous loss, for without abortion, America's Black community would now number 52 million persons. It would be 36 percent larger than it is. Abortion has swept through the Black community like a scythe, cutting down every fourth member." Calling abortion in America “racist genocide,” Childress said in an interview with Breitbart’s Thomas D. Williams, that since 1973, after the Supreme Court legalized abortion on demand, 13 million African-American babies have been put to death through abortion. He finds it especially “hypocritical” that the nation’s first black president provides funding for abortion giant Planned Parenthood. Childress, is known to sport a black-and-white t-shirt with the words, “Stop Funding Racism,” told Williams he is “appalled by NAACP silence” over what he calls a “pernicious attack” on African-Americans. “Barack Obama and his administration is funding Planned Parenthood” to the tune of $545 million a year, he said. That’s “very hypocritical” when so many black babies are aborted, said Rev. Dr. Childress. Pastor Childress is right, and with 1,876 African – American babies being aborted every day, the revelations that Planned Parenthood is trafficking in the body parts of aborted babies shows that for Margaret Sanger’s inheritors, like Hillary Clinton, the buying and selling of African – Americans remains perfectly acceptable.